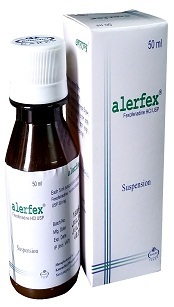 Alerfex 50ml Suspension Each 5 ml suspension contains Fexofenadine Hydrochloride USP 30mg. Alerfex 120mg Tablet Each film coated tablet contains Fexofenadin Hydrochloride USP 120mg. Alerfex (Fexofenadine Hydrochloride) the major active metabolite of Terfenadine, is an antihistamine with selective peripheral H1-receptor antagonist activity. Fexofenadine Hydrochloride inhibits antigen-induced bronchospasm and histamine release from peritoneal mast cell. Alerfex (Fexofenadine Hydrochloride) is rapidly absorbed after oral doses with peak plasma concentrations being reached in 2-3 hours. It is about 60 to 70% bound to plasma proteins. About 5% of the total doses is metabolized, mostly by the intestinal mucosa, with only 0.5 to 1.5% of the dose undergoing hepatic biotransformation by the cytochrome P450 syslem. Elimination half life of 14 hours has been reported although this may be prolonged in patients with renal impairment. Excretion is mainly in the faecs with only 10% being present in the urine. Fexofenadine does not appear to cress the blood-brain barrier. Alerfex is indicated for the relief of symptoms (sneezing, rhinorrhea, itchy nose/palate/throat, itchy/watery/red eyes) associated with seasonal allergic rhinitis in adults and children. Alerfex is also indicated for treatment of uncomplicated skin manifestations (pruritus and the number of wheals) of chronic idiopathic urticarial in adults and children. Adults and Children 12 years and older: The recommended dose of Fexofenadine is 60mg twice daily or 120mg once daily or 180mg once daily with water. A dose of 60mg once daily is recommended as the starting dose in patient with decreased renal function. Children 6 to 11 years: The recommended dose of Fexofenadine is 30mg twice daily. The recommended dose of Fexofenadine is 30mg once daily is recommended as the starting dose in pediatric patients with decreased renal function. Children 2 to 11 years: The recommended dose of Fexofenadine oral suspension is 30mg (5ml) twice dally. A dose of 30mg (5ml) once dailly is recommended as the starting dose in pediatric patients with decreased renal function. Children 2 to 11 years: 30mg (5ml) Fexofenadine Oral suspension twice daily. For paediatric patients with decreased renal function, the recommended dose of Fexofenadine Oral Suspension is 30mg (5ml) once daily. 15mg (2.5ml) Fexofenadine Oral Suspension twice daily. For pediatric patients with decreased renal function, the recommended starting dose of Fexofenadine Oral Suspension is 15 mg (2.5ml) once daily. The occurrence of side effect of Alerfex (Fexofenadine Hydrochloride) is lower, it is as like as placebo. The most frequently observed adverse reactions are headache, dyspepsia, drowsiness, dizziness, nausea, chest tightness, dyspnea, back pain etc. 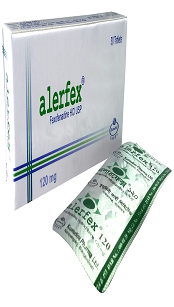 Alerfex (Faxofenadine Hydrochloride) is contraindicated in patients with known hypersensitivity to any of the ingredients. Rare cases of hypersensitivity reactions with manifestations such as angioedema, chest tightness, dyspnea, flushing and systemic anaphylaxis have been reported. Plasma concentration of Fexofenadine have been increased when given with Erythromycin or Ketoconazole. Antacid containing Aluminium and Magnesium Hydroxide reduces the absorption of Fexofenadine. Fruit juices including grapefruit may reduce the bioavailabilily of Fexofenadine and use together should be avoided. Store at a cool and dry place, protected from light and moisture. Keep out of reach of children. Keep the bottle tightly closed.